Travel Costs > How Much Does the Grand Canyon Skywalk Cost? How Much Does the Grand Canyon Skywalk Cost? 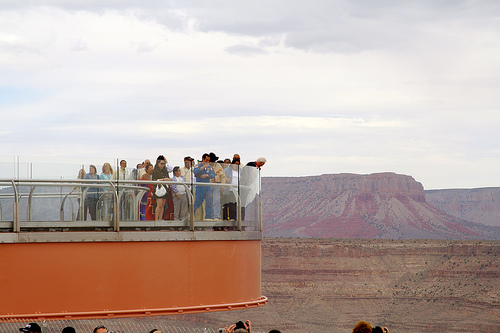 The Grand Canyon Skywalk, located in the Grand Canyon West, attracts close to 700,000 guests a year. Opened in 2007, the cantilevered glass-bottomed bridge appeals to adrenaline seekers, offering a once in a lifetime experience. How much does a Grand Canyon Skywalk ticket cost? As the Grand Canyon Skywalk can be tied in with a package or as an add-on with some tours, the costs of the skywalk admission will greatly vary depending on how you plan on visiting the Grand Canyon. For example, if you were to purchase a ticket to walk the skywalk, eat a meal, take a photo with tribal members and receive an official visitation certificate, then the costs, as of 2018, would be $82.37, according to GrandCanyonWest.com. If you want to just walk the skywalk and nothing else, the costs would be $21.65 per person; however, you must purchase the Hualapai Legacy entry package at the welcome center — another $49.92 — in order to take advantage of this price, bringing the grand total to $71.57 per person. From our research, this is the cheapest price you can take advantage of without any discounts and/or promotions. What is the Grand Canyon Skywalk? Being one of the newest attractions, opening in March of 2007, the plexiglass floor extends 70 feet over the edge of the Grand Canyon’s west rim, allowing visitors to look 4,000 feet into the canyon’s floor. The skywalk is 10 feet wide and the glass walls range anywhere from four to six feet high, just high enough to meet all safety code regulations. Only 120 will people will be allowed on the bridge at one time and it is on a first come, first serve basis. In order to avoid slipping, visitors will need to wear shoe covers while on the bridge. As we mention below, you will not be able to take your camera out on the skywalk. If you want to take advantage of a professional photo, the costs are said to be an additional $25 or so. Additional package add-ons may be considered, including mechanical bull rides ($5~), horseback rides ($10 to $80~), stagecoach rides ($16) and/or an overnight stay the Hualapai Ranch ($140~). One-day rafting tours, helicopter rides and flights are available as well. Grand Canyon West is not part of the Grand Canyon National Park and is solely owned and operated by the Hualapai Tribe. In order to even enter the skywalk area, the tribe will collect an entrance fee of $49.92 a person to access and any National Park-related pass will not apply here. Once past the entry point, no private vehicles are allowed to proceed past the entrance and all visitors must board the free shuttle service to view all of the attractions within the area. When inside the welcome center, this is the time when you meet with a tour operator and discuss which package you want to take advantage of for the day. Cameras and personal property will not be allowed on the skywalk. Before entering the area, all visitors will be asked to place any personal belongings inside of the locker. Those who want a photograph can take advantage of one of the many professional photographers who are on site to take your picture, which are later available for a fee. The best time to visit the skywalk, as per the GrandCanyon.net, is from the late fall to the spring when the daytime temperatures are comfortable, ranging from the low-to-mid 60s to mid-90s, with a majority of the days in the full sun. While the skywalk is open during the summer months, some guests may find the temperatures uncomfortable due to the above 100-degree temperatures. Many visitors are under the impression the skywalk is close to Grand Canyon Village, which isn’t the case as it much further. You can see how far the skywalk is by looking at this map. From Las Vegas, plan on spending at least three hours getting here. The reviews – is it worth it? Be very wary of the reviews as many people, even though the pictures look amazing, claim it’s a big rip off. TripAdvisor.com, for instance, has more than 4,000+ reviews, with a good majority claiming the price isn’t worth it, especially if you didn’t research the price ahead of time. It’s important to know, that in order to get here, you will travel 100+ miles from Las Vegas, a good 25% of it being on a slow-moving, very beat up dirt road. There’s no cell service, no services and no protection from the sun for at least 70 of these 100 miles if coming from Vegas. If you do know the prices you will pay ahead of time and you know what to expect from the trip, then you may not be as disappointed. While the Grand Canyon is a magnificent wonder of the world, almost everyone recommends taking the time to visit the actual National Park where you pay a fraction of the skywalk.